This week, Deputy Director Lesley Weiss and I had the chance to meet President of Georgia Giorgi Margvelashvili. 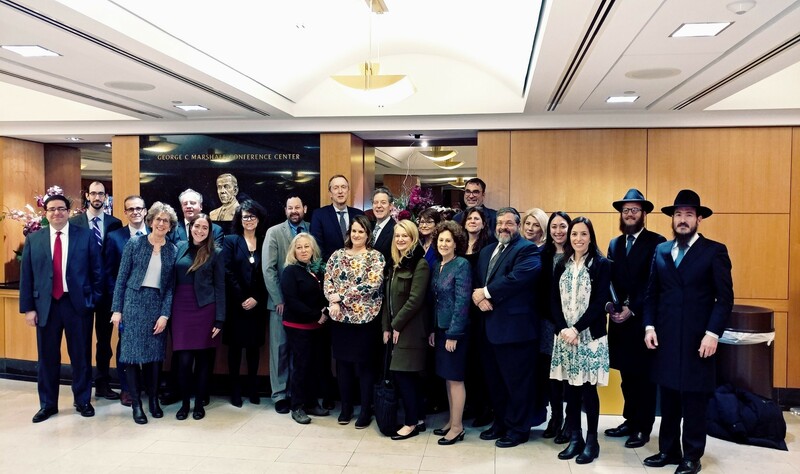 We also joined the leaders of several other Jewish organizations for a meeting with U.S. Ambassador at Large for International Religious Freedom Sam Brownback. We discussed the importance of appointing a Special Envoy to Monitor and Combat Anti-Semitism and several other challenges affecting Jewish communities around the world. Next week, I will be in Israel participating in the sixth Global Forum for Combating Anti-Semitism in Israel. We share with you an article highlighting the rise in anti-Semitic speech across Europe, an issue I will highlight at the Global Forum. Congressmen Steny Hoyer (D-MD), David Price (D-NC), and Brad Schneider (D-IL) co-authored a piece in Time Magazine on Poland's Anti-Defamation Law. As the controversy surrounding the law continues, Poland announced that March 24 will be marked as a national holiday to honor Poles who saved Jews during the Holocaust. Several members of Congress reacted to President Putin's comments regarding the possible involvement of Jews and other ethnic and religious minorities in interfering in the U.S. presidential election. You can read their statement here. We also share with you a report in The Guardian about Ukraine's National Militia group, an offshoot of the Azov Battalion, which we have been tracking for its connections to neo-Nazism. A member of the group interviewed for the article said, "There's nothing inherently wrong with national socialism as a political idea." 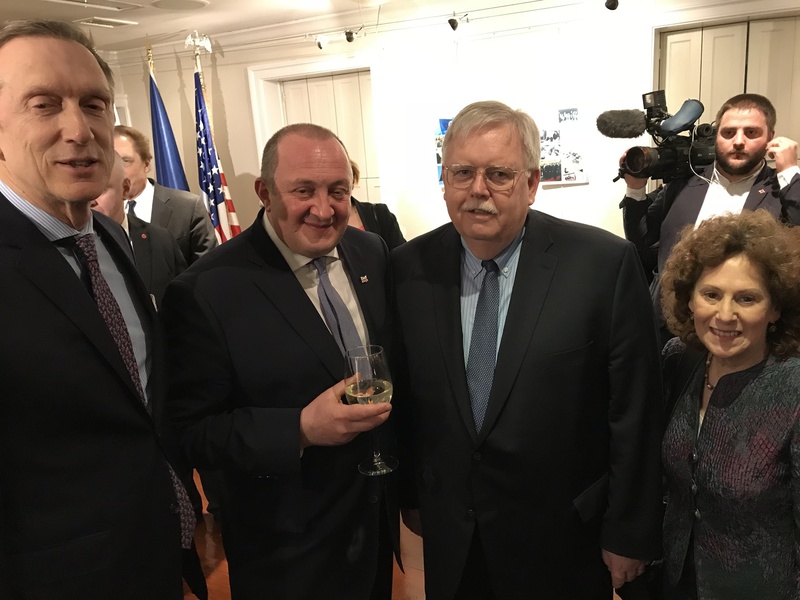 NCSEJ continues to raise its concerns regarding far-right groups in Ukraine with the Ukrainian government, the State Department, and partner organizations. (L-R) NCSEJ CEO Mark Levin, President of Georgia Giorgi Margvelashvili, former U.S. Ambassador to Russia John Tefft, and NCSEJ Deputy Director Lesley Weiss at the Embassy of Georgia. Leaders of Jewish organizations with U.S. Ambassador at Large for International Religious Freedom, Sam Brownback, pictured in the center to the right of NCSEJ CEO Mark Levin. Poland was a world leader in the cause of Holocaust remembrance. It can be again. Recent alarming events in Poland, most notably a law “protecting the reputation of the Polish nation” by criminalizing certain speech regarding the Holocaust, have led me to reflect on my own relationship with that country. It’s a relationship that spans three decades, dozens of visits, various negotiations — and the cultivation of many cherished friends and colleagues. I made my first visit in the summer of 1987 as a midlevel professional working for a project to build a Holocaust museum on the National Mall here. Upon seeing my first communist country, I was struck that everything was gray – the buildings, the interiors, the clothing. That turned out to be a somewhat superficial impression. Polish lawmakers approved a new bill on Wednesday that would make March 24 a national holiday of remembrance honoring Poles who risked their lives to save Jews during the Holocaust. On that date in 1944, members of the Polish Ulma family, a father, pregnant mother and their six children, were summarily executed by the Nazis in the village of Markowa after it was discovered that they were hiding Jews in their home. According to the Polish news agency, the new holiday is designed to commemorate the memory of Poles who saved their Jewish neighbors from extermination during the Nazi occupation of Poland. The bill states that the holiday will honor Poles who displayed courage and compassion and were "faithful to the highest moral values." Polish President Andrzej Duda is expected to soon sign the bill, which he himself initiated. The Trump administration imposed sanctions on a series of Russian organizations and individuals on Thursday in retaliation for interference in the 2016 presidential election and other “malicious cyberattacks,” its most significant action against Moscow since President Trump took office. I recently returned from a three-month stay in Budapest, where I was a fellow of the Institute for Advanced Study of the Central European University—a splendid graduate school of social sciences and philosophy founded by George Soros, which the government of Viktor Orbán has been trying to hound out of Hungary. My research is in literature and history, with occasional forays into film, but if you spend any time in Budapest or hang around the CEU these days, you cannot remain indifferent to the political climate. For one thing, the government’s steps against the university have been accompanied by a scurrilous ad-hominem campaign against Soros, whose anti-Semitic overtones are clear to all; for another, parliamentary elections are coming up in April.